Arriving at the little air-conditioned cottage in McLaren Vale nestled amongst the grape vines in the midst of this wine-producing region, we were well and truly ready for a small dose of luxury. We unpacked the bare necessities, enjoyed a warm shower and settled in for the night. The adventurer literally fell into the comfort of a ready-made bed with soft fluffy pillows and he slept ever so soundly that night, as we all did. 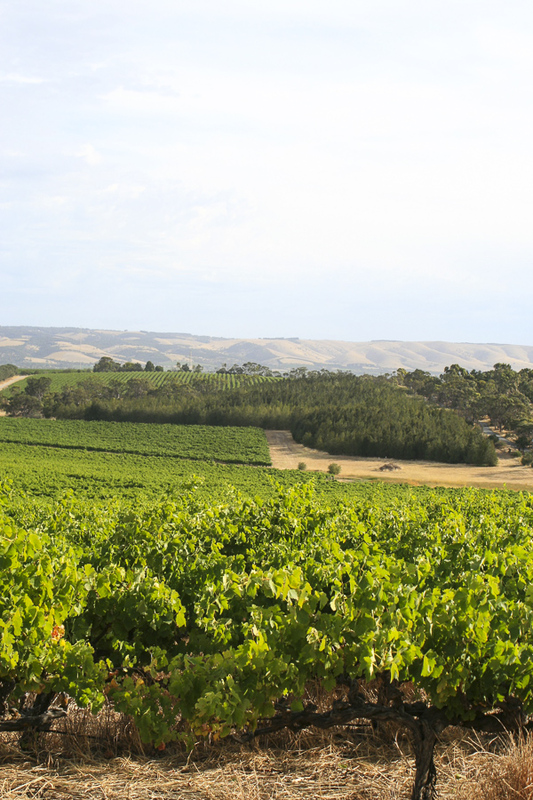 Food and wine abound on the Fleurieu Peninsula; farms, vineyards, markets, restaurants and cafes are generously scattered throughout. Ten minutes drive south from McLaren Vale was my favourite foodie place to visit, the little town of Willunga, home to the first farmers market in South Australia. The market runs every Saturday morning in Willunga Town Square, with more than sixty stalls selling fresh primary produce from regional farms and Fleurieu Peninsula products showcasing all that is fresh and seasonal. We visited the market that weekend and it was vibrant, filled with colourful characters like John in his rainbow knitted jumper who has sold his herbs and vegetables at the market for over 15 years, it was delightful to be surrounded by so many passionate producers. We happily enjoyed a delicious breakfast and then bought some amazing local produce to replenish our stores. South Australia is a seafood lover’s paradise with plenty of opportunity to catch it yourself as well as easy access to buy from the local fisherman. Willunga Farmers Market had a local guy selling Coorong mullet, garfish, tommy ruff and squid and we spotted a sign on the side of the road offering live marron available from a local bloke’s home. At Aldinga Bay we scored a kilo of Spencer Gulf prawns from the local seafood market, just perfect to stash away for the Christmas Day table the following week. The beauty of this region is that with all it offers in fertile land and produce, the coastline is only a short distance away. Aldinga Bay, Maslin Beach, Silver Sands and Port Willunga reveal vast stretches of sparkling coastline, long white sandy beaches and rugged rocky terrain. Some of the beaches are accessible by vehicle, where you can drive slowly along the water’s edge with the car windows down and the warm coastal breeze kissing you on the face. Heading further south we found Victor Harbor a popular coastal playground and historic Goolwa at the mouth of the Murray River on Lake Alexandria. Goolwa Beach is known for its surf fishing and an abundance of cockles. Mr G and the adventurer had their shoes off in no time and were massaging the sand with their toes in search of the white shelled, edible saltwater clam known as cockles. We left with a bag full, some to be enjoyed in a simple pasta dish later that evening and the rest to be used as live bait for fishing the next day. An incredible day on the water followed as we ventured out in our boat on The Coorong, a string of saltwater lagoons located in the Coorong National Park sheltered from the Southern Ocean by the sweeping sand dunes of the Younghusband Peninsula. It was a privilege to boat along such vast expanses of water teeming with birdlife and fish. We saw pods of pelicans gliding, a pair of emus bathing to cool off in the midday sun and boats of all shapes and sizes carrying hopeful fishermen, chasing a catch of Coorong mullet and school mulloway. This region was the pristine location of the popular 1977 film Storm Boy (based on Colin Thiele’s novel). It was magical to see this landscape and its resident pelicans still thriving and protected as featured in the film. A visit to the gorgeous town of Port Elliot and its stunning beach and wharf at nearby Horseshoe Bay was very picturesque, a great place to picnic or enjoy fish and chips from the café on the waterfront. The adventurer couldn’t resist a leap from the old, weathered timber wharf into the crystal clear waters below. The historic Pt Elliot Bakery has been a bakery and patisserie for over one hundred years and still attracts a daily queue for its freshly baked bread, pastries and pies. Another highlight of our time in this region was visiting a lovely local family who are farm biodynamic beef and grow market garden produce at Sunningdale Farm in Mosquito Hill. Arriving in the early afternoon we met Jane, her parents and their beef cattle and enjoyed a tour of the magnificent and expansive gardens that include a diverse range of heirloom vegetables, herbs and fruit. As with all country folk who seem to have mastered the art of hospitality, they made us feel so welcome. We were invited to share a simple afternoon tea together on their farmhouse veranda where stories and laughter flowed, as did cups of tea served with a freshly baked rhubarb cake and spoonfuls of homemade vanilla ice cream. There was so much to see on the Fleurieu Peninsula, we really enjoyed all we could squeeze in and savoured those couple of nights rest with a real roof over our heads. Refreshed and restocked with abundant provisions, and a case of wine from one of our favourite organic vineyards stashed in the boat we were ready to keep moving west. We didn’t think things could get more spectacular in the pursuit of hunting and gathering your own food and yet what followed for us in the sleepy town of Streaky Bay on the Eyre Peninsula exceeded our greatest expectations.